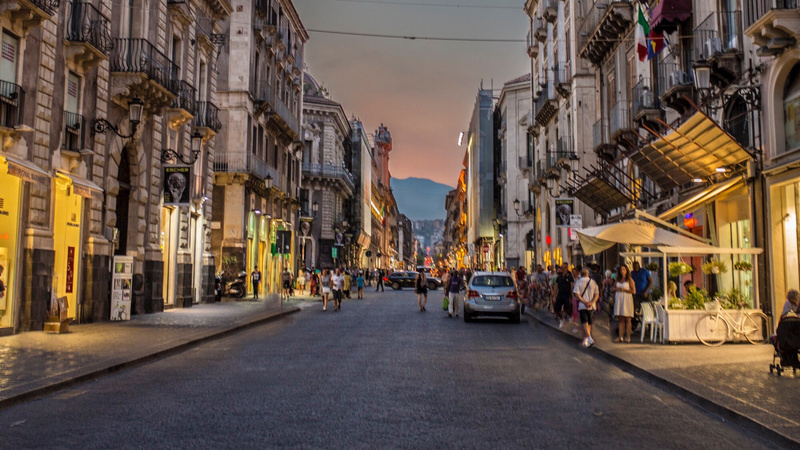 In Catania, Sicily, where the pavements and buildings are made out of ash-grey volcanic rock, dusk casts the city in a spectral light. Above me the sky is blushing pink, yet down here on the ground everything feels dark and close; the inky blackness swallowing up the feeble glow coming from the lampposts. Yet it's here, sat at a plastic table in a square of fluorescent light spilling from the windows of Macelleria Leone, a butcher's shop with just one enormous slab of meat loosely covered in a cloth on a table in the doorway, that I'm about to have one of the most genuinely welcoming experiences of my life. A plastic red-and-white-checked tablecloth is produced and oh-so-carefully laid over the table – I'm getting the fancy treatment – a stack of plastic cups is placed in front of me, and a one-litre plastic bottle of chilled wine is opened and poured. Warm poppy seed buns in a paper bag are run down from a nearby bakery by a breathless little boy, and hunks of meat are slapped onto a rudimentary charcoal grill that sizzles at the roadside. Cooking these steaks is Leone, a tiny, smiling 70-year-old Sicilian who hovers around our table while we eat. Within minutes, I'm presented with a fillet steak, all charcoal crust on the outside and perfectly pink on the inside. I squeeze over some lemon juice, before adding a dash of vinegar, then slide it into a bun and take a bite, juice dripping onto the paper plate. Tender and flavoursome, the meat is incredible. But this isn't high-grade beef that comes from a retired dairy cow; it's horse, and Leone is one of Catania's few remaining traditional horse meat butchers. To outsiders, the tradition of eating horse – which you'll find all around southern Italy – is controversial. Some people in my group don't eat it; others gingerly try a few bites and declare they're finished; and a select few eat everything on the table and more as Leone continues to send over paper plates. Even within the country, attitudes are changing. Recent years have seen calls for Italy to ban the sale of equine meat, and the country was also shocked by the horse meat scandal in 2013. Many think it is time for Italy to reconsider its relationship with horses, and reclass them as domestic pets. Today, Italy imports 84% of its horse meat and there are 400 registered equine butchers left around the country. Full disclosure: I like horses, but I've never owned one, and perhaps that's why I can devour my sandwich with such relish. But, all things considered, the meal makes me wonder why we don't eat horse meat. The horses aren't reared to be eaten; they're retired riding horses (not race horses because of the possibility of doping), so the animals have been looked after. The meat itself is lean and rich in iron, and is often recommended to pregnant women and children. My companions liken it to eating dog or cat, which I admittedly wouldn't do. Yet I think there are better comparisons: goat, for example, a meat that's become more popular in the UK thanks to companies like Cabrito, which saves billy goats that would otherwise be killed at birth. In a time when a global food shortage is looming, eating nutritious meat that from an animal that's been reared with love makes perfect sense. In fact, it strikes me as more weird that we think it's OK to eat meat from intensively reared animals that were born with the sole purpose of being eaten. So I think Catania, Leone and his fellow horse meat butchers have got it right – and, of course, it helps when the food in question tastes this good, too.